Atlas V, powered by its Russian-built main engine and three Solid Rocket Boosters for extra thrust, is set for liftoff at 18:27 UTC, the opening of a two-hour launch window. After the boosters and core stage have done their job, the trusted Centaur Upper Stage will be fired twice to inject the EchoStar 19 satellite in a Super-Synchronous Transfer Orbit peaking 65,000 Kilometers above the planet. 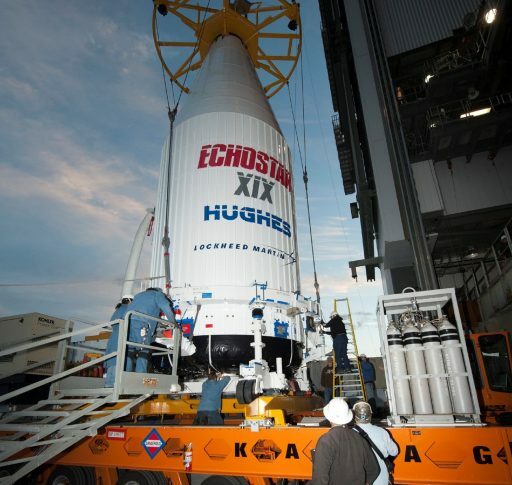 EchoStar 19 is one of the most powerful communications satellites ever built, weighing in at 6,760 Kilograms and hosting a powerful Ka-Band payload that will deliver coast-to-coast coverage of the United States to deliver Internet to customers who do not have access to high-speed terrestrial networks. 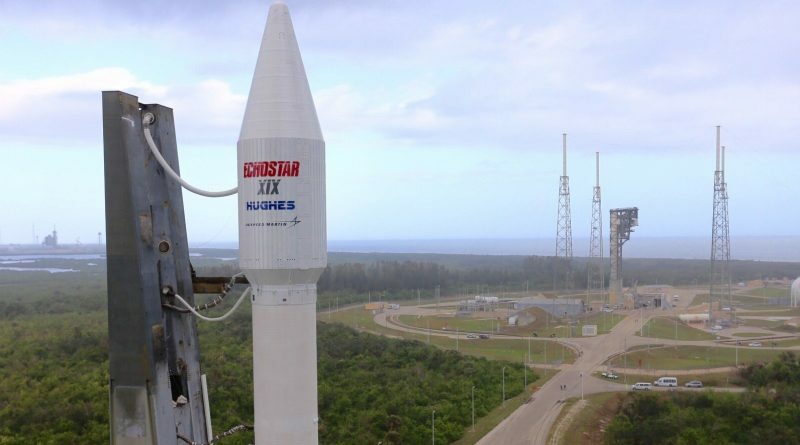 The launch of EchoStar 19 will provide some urgently needed relief as satellite operator Hughes has filled a number of the company’s beams to full capacity, requiring additional capacity be able to offer services to more customers. 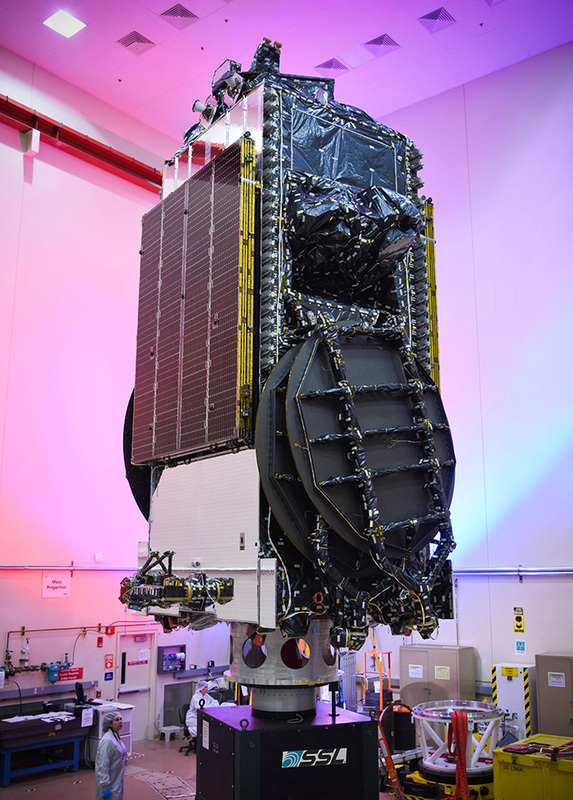 Taking its spot in Geostationary Orbit, EchoStar 19 will be parked 36,000 Kilometers above the equator from where it can cover the entire U.S. and its territories with 138 spotbeams placed over areas needing service. Small rooftop antennas send and receive signals from the satellite which connects homes and business to ground-based gateways to access the world wide web with a delay of only a fraction of a second. 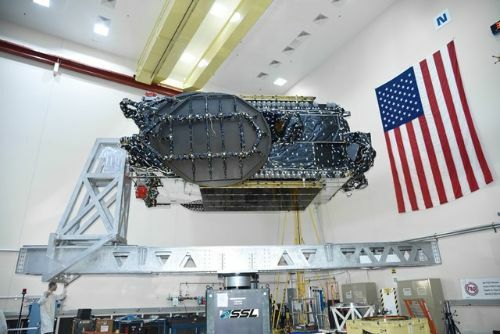 EchoStar 19 is the world’s highest capacity Ka-Band broadband satellite with 50% more capacity than EchoStar 17 that has been serving one million American customers since 2012. Additional capacity on the new satellite will also be used to expand HughesNet’s business in Canada and Central America. In total, the satellite will support a data throughput of 220 gigabits per second – satisfying the demand for increased customer online time and video consumption. Hughes is also preparing to introduce new customer terminals to support faster speeds and be easier to use with built-in WiFi. EchoStar 19 is also planned to deliver in-flight Internet as part of HughesNet’s aero business with 200Mbit/s of data delivered to each airplane flying at cruising altitude. The all-Ka-Band satellite is based on the proven Space Systems/Loral SSL-1300 platform and was originally expected to launch on an Ariane 5 rocket as part of a multi-launch agreement with Arianespace. However, no slot was available on the European workhorse in the second half of 2016. Although Atlas V comes at a higher price tag than a flight on Ariane 5, EchoStar expects the benefits of having the satellite in orbit several months before an Ariane 5 slot opens will outweigh the additional cost through revenue from the satellite by capturing unmet demand for broadband services. Also, Atlas V can deliver the spacecraft to a Supersynchronous Transfer Orbit and save it considerable propellants which can mean additional revenue as it extends the satellite’s operational life. 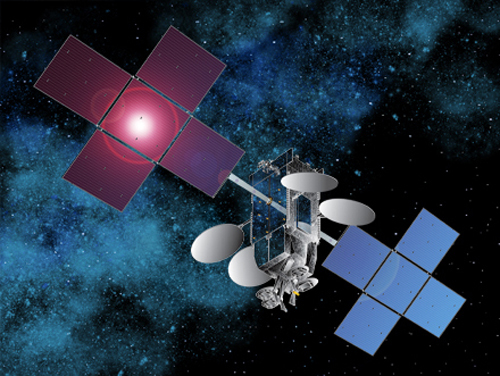 A launch of EchoStar 19 in late 2016 also enables the satellite to enter operation before the competitor spacecraft, ViaSat-2, becomes operational and EchoStar hopes to capture new customers by making expanded services available before the competitor comes online. ViaSat had booked a Falcon Heavy to launch ViaSat-2 by the end of 2016, but the inauguration of the rocket slipped well beyond that point, requiring the company to re-plan and switch to Ariane 5 that could not facilitate the satellite before early 2017. 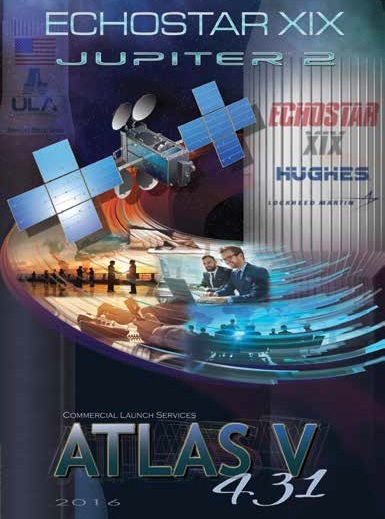 Lockheed Martin Commercial Launch Services received the launch contract for EchoStar 19 in mid 2015 and United Launch Alliance provides and operates the Atlas launch vehicle for its parent company. 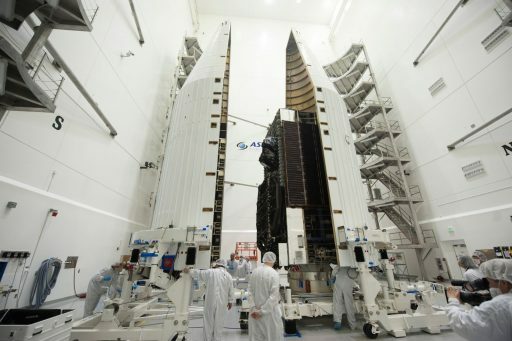 EchoStar 19 was delivered to Cape Canaveral on November 7 to enter final processing and take its place atop the Atlas V in December. A two-day delay from Dec. 16 enabled a minor issue with the Atlas V booster to be corrected and ULA held a clean Launch Readiness Review on Friday. Standing over 60 meters tall, Atlas V emerged from its assembly building at 9:30 a.m. local time on Saturday, slowly rolling to the launch pad at Space Launch Complex 41. Once Atlas V was centered on its launch pad, teams began preparations for loading the vehicle with 94,600 liters of fuel prior to the initiation of countdown operations in the early morning hours on Sunday. To send the heavy satellite on its way, Atlas V flies in the most powerful configuration available in the 400 series of the rocket, strapping a trio of Solid Rocket Boosters on the RD-180-powered core stage for extra thrust delivered during the initial flight phase. 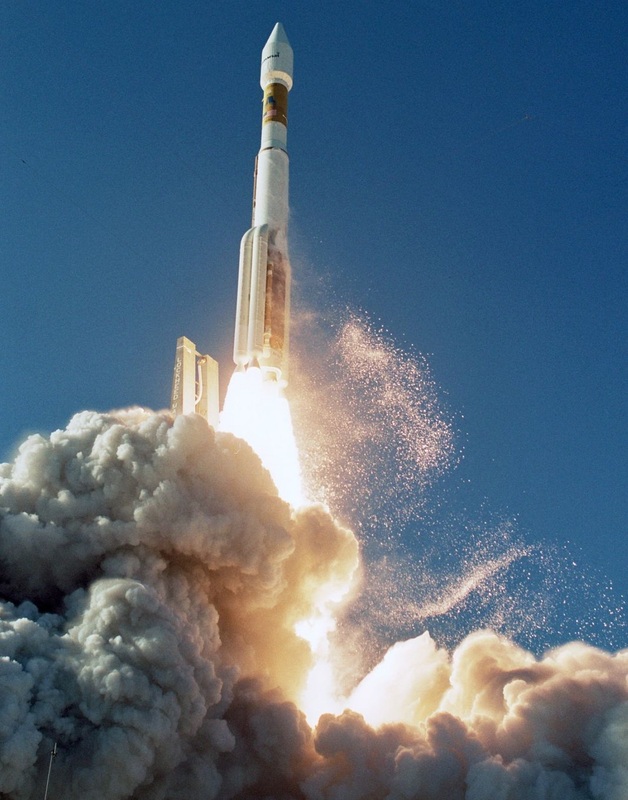 Atlas V 431 has so far only been flown twice – in 2005 to lift the Inmarsat-4 F1 communications satellite and again in 2009 when lifting the Intelsat 14 spacecraft. 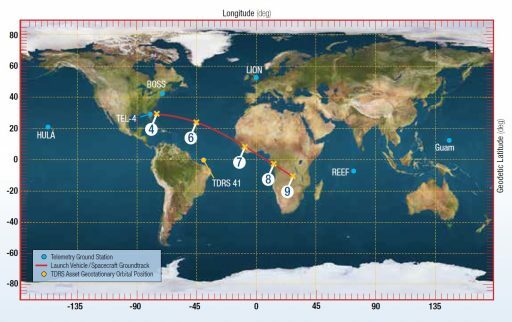 On Sunday, Atlas V will power away from Florida on a south-easterly flight path, dropping the three boosters two minutes and five seconds into the flight followed by the end of the first stage burn four and a half minutes into the mission. Centaur will light its RL-10C engine twice, first to place the stack in a Low Earth Parking Orbit and again to boost the high point of the orbit to 65,000 Kilometers for spacecraft separation 32 minutes after launch. Meteorologists are predicting mostly favorable conditions for Sunday’s launch opportunity with a 70% chance of acceptable weather. The primary concerns are violations of the thick and cumulus cloud rules with a slight isolated shower threat later in the window. Ahead of the countdown, technicians will already be busy at the pad, completing final hands-on work and closing out the Vertical Integration Facility, pad facilities and the Atlas V launcher. 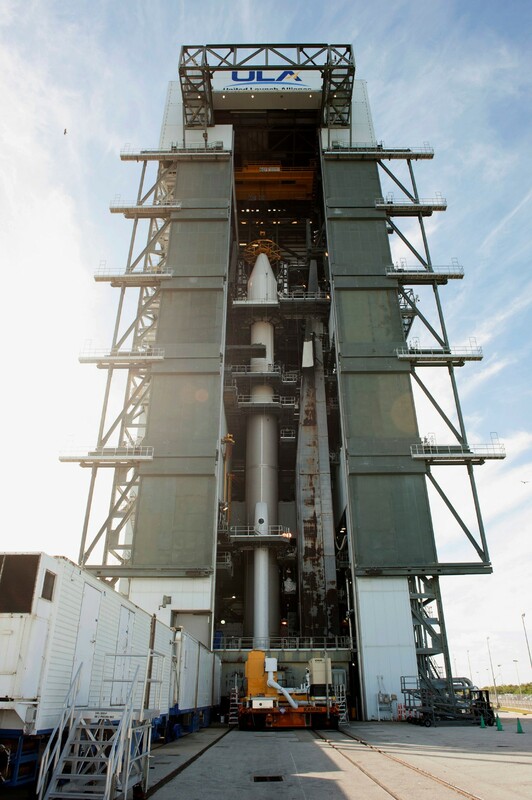 The first step completed at T-6 Hours 20 Minutes is the activation of the Atlas V rocket for a series of checkouts, in progress while teams wrap up final close outs of the launch vehicle and ground facilities at SLC-41. The final tank to be loaded during the countdown is the Liquid Hydrogen Tank of the upper stage that also goes through the usual steps to be filled with 48,100 liters of -253-degree Celsius LH2 fuel. Centaur can look back at over 200 previous missions – most of which coupled with an Atlas – a duo that has been operating for several decades. When clocks reach T-4 Minutes, the countdown enters its second built-in hold for final polling of the launch team prior to pressing into Terminal Count. This hold can be extended in case of technical issues or uncooperative weather. As the three boosters ignite, Atlas V will jump off the pad with a liftoff thrust of 907 metric-ton-force, creating an initial thrust to weight ratio of 1.9. 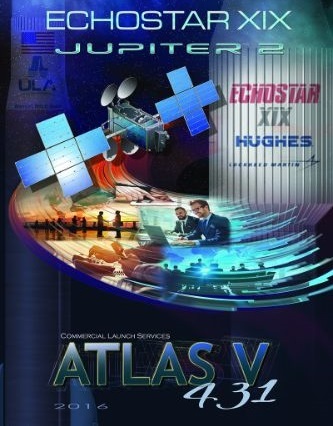 Less than six seconds after liftoff, Atlas V will start its roll and pitch program to align itself with its precise ascent path, heading east-south-east for a quick pass over the Atlantic. Atlas V will pass Mach 1 just 45 seconds after blastoff and encounter Maximum Dynamic Pressure just after passing 57 seconds into the flight. Burning out after 94 seconds, the four SRMs will have completed their job of providing that extra push needed to boost EchoStar 19 into orbit. The vehicle will hold onto the SRMs for about 30 more seconds before separating them in a more benign aerodynamic environment, also ensuring a safe splashdown in the ocean. Powered by the RD-180 engine alone, Atlas V will continue its flight, burning 1,150 Kilograms of propellant each second. Approaching the end of the first stage burn, the RD-180 engine will be throttled back to maintain a maximum acceleration of 4.6 Gs. Shutdown of the Common Core Booster occurs at T+4 minutes and 26 seconds followed six seconds later by stage separation that is accomplished by firing pyrotechnics and igniting eight retrorockets on the CCB to safely take it away from the Centaur Upper Stage. 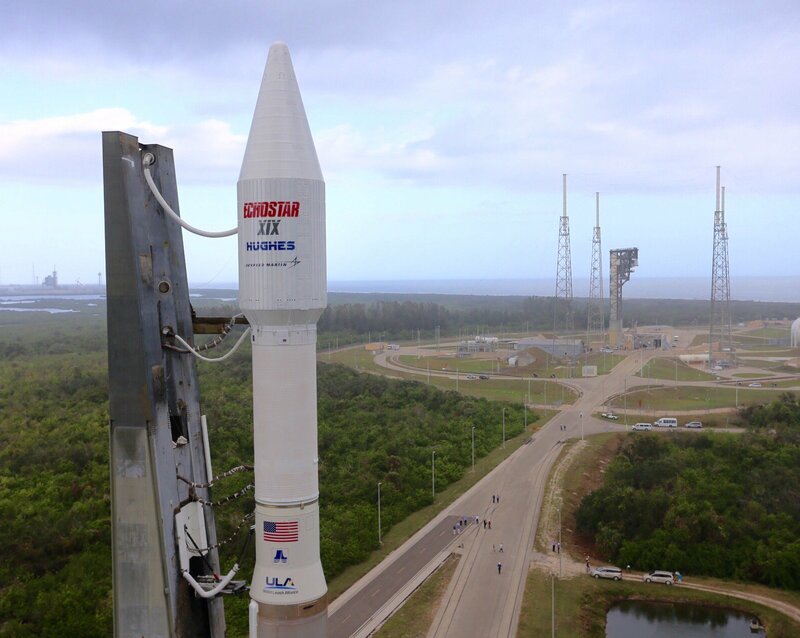 Centaur will ignite its RL-10C engine on the first of three burns at T+4:42.1 – set to fire for 8 minutes and 56 seconds at a thrust of 10,800 Kilogram-force to push the stack into a Low Earth Parking Orbit. Ten seconds into the Centaur burn, Atlas V will split open its four-meter payload fairing and jettison the fairing halves to shed no-longer needed weight as aerodynamic forces can no longer harm the satellite once over 100 Kilometers in altitude. After Centaur shutdown, the mission enters a nine and a half-minute coast phase to conduct the second burn around the equator so that the high point of the insertion orbit is placed high above the equator to ease the process of phasing the satellite into its operational Geostationary Orbit. Engine re-start is expected just after 23 minutes into the mission and Centaur will fire for four minutes and 47 seconds to deliver EchoStar 19 to an orbit of 204 by 65,000 Kilometers, inclined 25.44 degrees. Released into Supersynchronous Transfer Orbit 32 minutes after launch, EchoStar 19 will complete a series of engine burns to transition into a circular orbit at zero inclination to remain locked in position as seen from Earth. Once on station, the satellite will fully deploy its five-panel solar arrays and four communications antennas to head into a checkout period before entering active service in the first half of 2017.